It is almost as if you are traveling through time when walking through the city of Paris. There are various styles of architecture, some since the Middle Ages, to behold, such as Gothic, Art Nouveau, and Belle Époque. In addition, there are several important monuments from the French Renaissance, the Classical Revival, and the flamboyant style during the reign of Napoleon III. Whether you are marvelling at the city views, indulging in local restaurants, or searching for your own property in Paris, it is important to understand the neighborhoods in which you are situated. As a result, we bring you a list of the best neighborhoods in Paris with influential architecture for your spectacle! Built in the 19th century, Palais Garnier is a building of vast opulence and beauty, consisting of elaborate ornamentation with Neo-Baroque decorative elements. It is considered the Second-Empire Beaux-Arts style with axial symmetry. 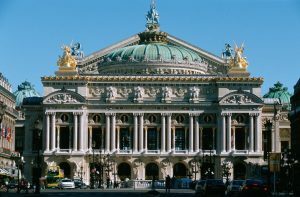 It is located in Place de l’Opéra, a lively location filled with restaurants, theaters, and other stores. It is also a unique residential neighborhood with classic Haussmannien apartments, making it a wonderful place to discover your own property in Paris. Consecrated in 1919, Sacré-Coeur is an iconic Parisian monument located in Montmartre. The cathedral oversees the entire city, where its beautiful Roman-Byzantine architecture is seen by miles. Inside, the ceiling is decorated with the largest mosaic in France, measuring about 480 m². There is access to the dome, where the panoramic views are enhanced. This would be one of the most beautiful neighborhoods to own property in Paris, since it includes a strong culture in gastronomy, public events, and nightlife. The Centre Pompidou, designed by Renzo Piano and Richard Rogers, is a 20th-century structure with rather modern architecture. The building vastly contrasts all others in its neighborhood, Le Marais, with its tubular style. The building was influential to this neighborhood in many ways, such as increasing the prices of property or even attracting art from all over the world. As a result, the neighborhood has blossomed with a lively atmosphere that can be enjoyed all through the day. This medieval Catholic cathedral, completed in 1345, is located on Île de la Cité. It expresses Gothic architecture through its naturalist sculptures, unique stained glass, and wide-pointed arches. The parvis contains many events throughout the year, such as a live light show during the winter. The architecture indeed enhances the beauty of Paris while unifying the people in the neighborhood. Designed by Jean Chalgrin and sculpted between 1806 – 1836, Arc de Triomphe is a Neoclassical version of Roman architecture. The structure stands at the center of Place Charles de Gaulle, overlooking the famous avenue des Champs-Élysées. The Arc itself holds deep historic significance, certainly another marvel in the city of Paris. The surrounding area contains high class restaurants and chic shops, which is a great attraction for nightlife. It is most definately a world-class location to own property in Paris.